This is belly dancing 101. You'll learn the foundations of belly dance including hip isolations, chest isolations, undulations, arm movements, basic turns, and shimmies. Movements will be broken down and explained so that you can master the technique, and then will be combined into easy, yet fun combinations. Musicality and history of the dance will also be included. Next Session: No classes currently scheduled. Please check back later in 2019 for updates. Alessandra is available for private and semi-private instruction. Classes are tailored to the needs of the individual student. Pricing depends on desired location and length of session. Discounts are given for purchasing multiple lessons. Learn with a friend - Add $15 to any of the above options for the two of you to study together. For groups of three or more, add $15 for the first friend and $10 for each additional person. Note: If you prefer to learn in a dance studio, a location can be rented for an additional fee. Purchase a package of 5 lessons and receive 15% off. To Purchase: Email Alessandra at alessandra@alessandradance.com or use the PayPal drop-down box below. Because it's fun and flirty, sassy and playful. It will challenge you and boost your confidence. You'll learn a new skill while getting in a great workout. Sign up today! This class is designed for those who want to get in shape while having fun. Class focuses on fitness, with less emphasis on technique. Typical class structure is a warm-up, followed by stretching, a short technique or drill based section, and then the major portion of the class, which is focused on movement, burning calories and bringing that inner dance goddess to life. Class ends with a belly-dance targeted strength section (as time permits) and always ends with a cool-down. No classes are currently offerred of Belly Dance Blast. Check back for updates! Subscribe to mailing list for alerts on new classes, events and special offers! This class is designed for students ready to continue their belly dance journey beyond basics. This series will introduce zills (finger cymbals), including basic technique and patterns. Basic veil technique will be taught as well. Intermediate belly dance movements and more advance layering techniques will be introduced and drilled. Classes will also include short lecture portions delving into more detail on the history of belly dance, styles of belly dance, and Middle Eastern instruments and music. Prerequisite: At least one beginning belly dance class with Alessandra or another instructor. Students don't need to be able to execute movements "perfectly", but student should understand the mechanics behind all basic belly dance movements and not require a detailed explanation of how to perform the movement. Previous finger cymbal experience is not required. Next Session: No sessions are currently scheduled. Check back later in 2019! Required Materials: Students must have a pair of finger cymbals (recommended brand is Saroyan) and a veil (silk is recommended). Please contact Alessandra if you have questions on where or how to purchase these items. This class is designed for students who want to hone and perfect the technique from Belly Dance Basics. The first half of class will be spent reviewing and drilling the movements learned in beginning belly dance to help cement proper technique. The second half of class will be spent dancing. 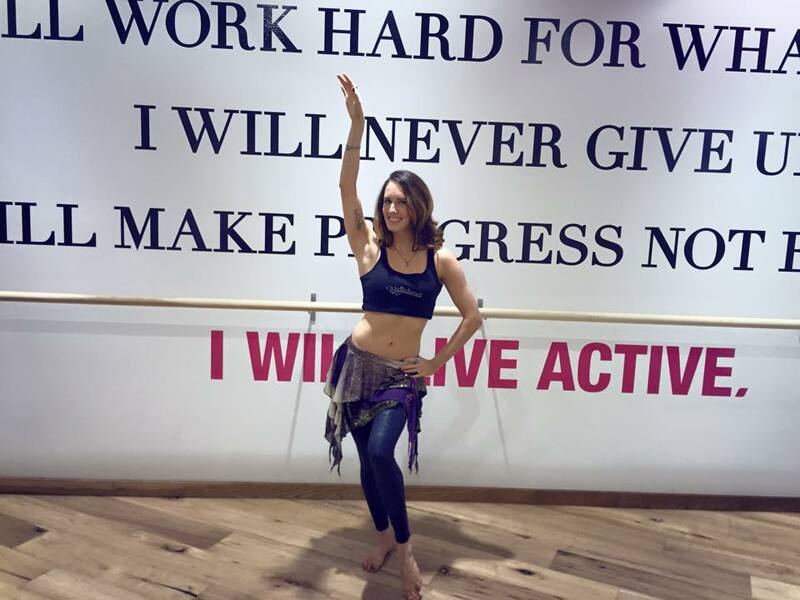 Students will follow along with Alessandra as she flows through belly dance movements. This portion of class will also include an increased emphasis on musicality, basic Middle Eastern rhythms, and performance technique. Prerequisite: At least one beginning belly dance class with Alessandra or another instructor.